Triennale di Milano, Design Museum, Austrian Design Explosion, Milan, Italy. Galerie Klovićevi Dvori, designforum Veinna, Angewandt & Alltäglich, Austrian Design, Zagreb, Croatia. La Pelota, Austrian Design Pioneers, Fuorisalone, Brera Design District, Salone Internazionale del Mobile, Milan, Italy. EUROLUCE 2015, Karboxx, Salone Internazionale del Mobile, Milan, Italy. ICFF, New York City, Jacob K. Javits Convention Center, NY, USA. MAK Designlabor, MAK – Austrian Museum of Applied Arts / Contemporary Art, Vienna, Austria. 21er Haus – the new Museum of Contemporary Art, Vienna, Involuto, a design project by Thomas Feichtner touches base with Franz West and Heimo Zobernig. Feb. – June 2014. Arch Moscow, The Central House of Artists, Moscow, Russia. Confession of Design, Rotonda della Besana, Salone Internazionale del Mobile, Milan, Italy. Window Gallery, curated by Vienna Design Week, Design Eclipse, an Installation by Thomas Feichtner, stilwerk, Austria. ICFF New York 2013, Jacob K. Javits Convention Center: New York, USA. Belgrade Design Week exhibitions at the Museum of Contemporary Art. Salone Internazionale del Mobile, Milan, Italy. Semper Depot Vienna, Homedepot 2013, Austria. Salone dei Tessuti Milano, Austrian Design DETALS, Milan, Italy. imm Cologne, Interior Innovation Exhibition 2013, Rat für Formgebung / German Design Council, Cologne, Germany. Designgalleriet Stockholm, A taste of Austrian Design and Lifestyle, Stockholm, Sweden. La Pelota Milano, Austrian Design - Raw and Delicate, Zona Brera, Milan, Italy. Maribor 2012 – European Capital of Culture, Austrian Design, Maribor, Slovenia. Kunsthaus Graz, Walk of Fame, designforum Steiermark, Graz, Austria. 21er Haus, Five Years of Wien Product Collection, Vienna, Austria. 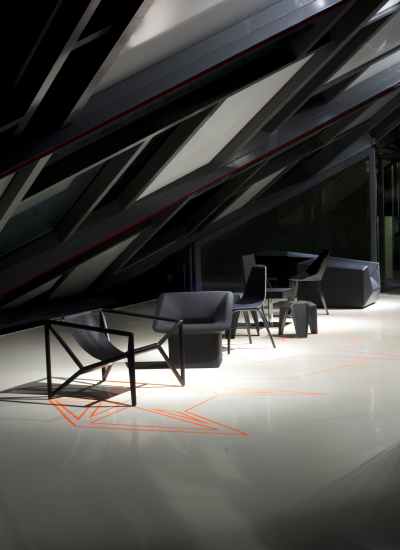 Vienna Design Week 2012, Basso an Installation with Eternit, Grelle Forelle, Vienna, Austria. Architecture Museum of Ljubljana, 23nd Biennial of Industrial Design 2010, Fužine Castle Ljubljana, Slovenia. Maison & Objet Paris, Fance. imm Cologne, Interior Innovation Exhibition 2012, Rat für Formgebung / German Design Council, Cologne, Germany. Barcelona World Architecture Festival, Advantage Austria Lounge, Barcelona, Spain. MAK-Design Shop, Fina – After Work Meeting Point, Vienna, Austria. Vienna Design Week 2011, M3 Chair Installation, Vienna, Austria. Haus Wittgenstein, fair - Zeitung für Kunst und Ästhetik, Wien / Berlin, Vienna, Austria. Istanbul Design Week, Austrian Design Spirit, Old Hat Factory, Istambul, Turkey. Palais Dorotheum, Design, Vienna, Austria. Lichtensteinmuseum, Wien Product Collection, Vienna, Austria. Dezeenspace, London, Dezeen Platform, London, UK. MAK-Design Shop, In neuem Licht, Vienna, Austria. Austrian Cultural Forum, Hands-On Design, Solo Exhibition, London, England. 100% Design London, London, England. Maison & Objet, Paris, Leitner Leinen, Carl Mertens, J. & L. Lobmeyr, Paris, Fance. Beijing International Design Triennial (BIDT) Reason Design Emotion, Tian’anmen Square, Beijing, China. MQ Museumsquartier, Staatspreis Ausstellung, Walk of Fame, Design Austria, , Vienna, Austria. Design Week Istanbul, Austrian Design Spirit, in der Old Hat Factory, Istanbul, Turkey. Design Night Festival Tallinn, Editorial Design, Tallinn, Estland. Maison&Objet Paris, Parc des Expositions de Paris Nord Villepinte, Paris, France. IBU Gallery, Jardins du Palais Royal, Paris, France. Sofia Design Week, Heuriger on Tour, Vienna Design Week Embassy, Sofia, Bulgaria. DMY International Design Festival Berlin, Heuriger on Tour, Vienna Design Week Embassy, Berlin, Germany. MAK – Austrian Museum of Applied Arts / Contemporary Art, Furniture Study Collection, Vienna, Austria. Alma Mater Gallery, One to Five - chair design concepts, Solo-Exhibition, University of Sofia, Bulgaria. National Gallery for Foreign Art Sofia, GD2D + PD3D, Fresh Air by Pure Austrian Design, Sofia, Bulgaria. Mikser Design Expo Belgrad, Vienna Design Week Embassy, Belgrade, Serbia. ICFF New York, Heuriger on Tour, New York, USA. Zona Tortona Milano, Design Vision Austria, Zona Tortona - Fabrica Bugatti, Milan, Italy. FAD Barcelona, Surprising Ingenuity, FAD (Fomento de las Artes y del Diseño) Barcelona, Spain. Designhuis Eindhoven, The Liberation of light, Einhoven, Netherlands. Musée d‘Art moderne de la ville de Paris, Carnets d‘inspiration, Paris, France. International Biennial of Design, Saint Etienne, France. Architecture Museum of Ljubljana, 22nd Biennial of Industrial Design 2010, Fužine Castle Ljubljana, Slovenia. La Biennale di Venezia, Longing for, Arsenale, 12. Mostra Internationale di Architettura, La Biennale di Venezia 2010, Italy. Hofmobiliendepot, Fair, Art magazine, Möbel Museum Wien, Austria. Dorotheum Wien, Design Auction 2010, Austria. 10 festival for fashion & photography, Guerilla Store, Unit F, Vienna, Austria. Altonaer Museum Hamburg, altonale, GD2D + PD3D, fresh air by Pure Austrian Design Hamburg, Germany. Salone Internazionale del Mobile 2010, Surprising Ingenuity - Austrian Design, Fabrica Bugatti, Zona Tortona, Milan, Italy. The Aram Gallery London, Prototypes and Experiments, London, UK. Milan Historic House Museums “Unexpected Guests. Homes of Yesteryear, Design of Today” Bagatti Valsecchi Museum, Boschi Di Stefano Historic House Museum, Necchi Campiglio Villa, Poldi Pezzoli Museum, Milan, Italy. Montblanc Paris, Poem Island, Paris, France. designforum, Museums Quartier, GD2D+PD3D, fresh air by PureAustrianDesign, Vienna, Austria. State Gallery Linz, Der Fall Forum Design, Upper Austrian State Museum, Linz, Austria. Linz 2009, Design Jungle, Designforum Linz. Linz 2009 European Capital of Culture, Austria. Vienna Design Week 2009, Vienna, Austria. 100% Design Tokyo, Spot on Wien, Flashing Austrian Design and Music, Tokyo, Japan. ARoS Kunstmuseum, Aarhus, GD2D+PD3D, fresh air by PureAustrianDesign, Aarhus, Denmark. Kunstverein Medienturm Graz, Das blaue Licht, The tendency towards the crystalline in art and design. Graz, Austria. Salone Internazionale del Mobile, Off the record, O‘ Artoteca, Zona Isola, Milan, Italy. Castelliotissa Palace, GD2D+PD3D, fresh air by PureAustrianDesign, Nicosia, Cyprus. Hong Kong Design Centre, GD2D+PD3D, fresh air by PureAustrianDesign, Hong Kong, China. Pixel Hotel, Galerie Simone Feichtner, a project for Linz 2009, European Capital of Culture, Linz, Austria. Design Flanders Gallery, European Year of Creativity and Innovation, Brussels, Belgium. Torino 2008, Austrian Design, design austria, Torino 2008 World Design Capital, Turin, Italy. red dot design museum, Design Austria, Zollverein Essen, Germany. Independent Culture Centre Kosice, Design Match 2008, Kosice, Slovakia. National Gallery Prague, Design Match 2008, Czech Republic. VAM Design Museum, Budapest Design Week, Design Match 2008, Budapest, Hungary. Designer Ralley 2008, Home & Interieur, Vienna, Austria. House of Art, Bratislava, Design Match 2008, Bratislava, Slovakia. World Best Design Seoul, Korea. Austrian position at the World Best Design Exchange, Atlantic Hall in Seoul, Korea. Hungarian Museum of Trade, Austrian Design, Budapest, Hungary. Blickfang Zürich, Austria’s contemporary design, Zurich, Switzerland. Tokyo Designer’s Week 2007, Blickfang, Tokyo. Pure Austrian Design at the Jingu-Gaien fair grounds. Tokyo, Japan. Salzburg Festival, ORF Kultur Lounge, Salzburg, Austria. Gansevoort Gallery New York, Surface Magazine, New York, USA. ICFF New York, Pure Austrian Design, New York, USA. The Edge Sydney, Austrian contribution, Sydney, Australia. IMM Cologne, International Furniture Fair, Cologne, Germany. Architecture Museum of Ljubljana, BIO, Biennial of Industrial Design, Slovenia. 100% East London, Pure Austrian Design, London, England. Kunsthalle Wien, Project Space, Vienna, Austria. Triennale di Milano, Axiome, Design Museum Milan. Italy. Design Center Stuttgart, Face to Face, Germany. Design Center Linz, Examples of Austrian Design, Austria. EXPO Hanover, at the pavilion of the Industry Forum Design Hanover beside the IF Design Award 2000. Adolf Loos Haus, Design Zone, Vienna, Austria.